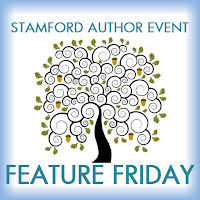 It's Friday and today marks the first week in of the FEATURE FRIDAY events being held to promote and gear up for the Stamford Author Event this August. For the next 14 Fridays we will be featuring one author and book and holding a week long giveaway. Since we are one of the eight Official Bloggers for the Event, the promoter has arranged for every blogger to participate. We hope you check out the other blogs to see what they're offering and find out about more authors who will be be at the Stamford event. Find the complete event listing here. Our kick-off week begins with a Women's Lit book by Francine LaSala. 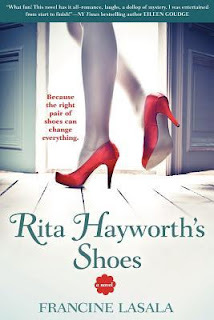 Sparkly and witty as a 1940s screwball comedy, and filled with quirky characters and lots of delightful surprises, Rita Hayworth's Shoes is a story of bouncing back, a heartwarming and potentially heartbreaking romance, and even a mystery rolled into one fun, hilarious page-turner! Drop me a note: francine@francinelasala.com. One ebook copy of Rita Hayworth's Shoes (open internationally). Our giveaway ends May 15. I did buy a beautiful handbag a while back. I still love it & use it heaps, so it was totally worth it. can't say I have - my wedding dress - most expensive piece of clothing I've ever bought - it was $170, only ten yrs ago. I'm thrifty and always have been.